"Hebron First" gathering calls to remove Jews from city. Knesset Speaker Yuli Edelstein prevented a planned meeting at the Knesset that would have called for the removal of all Israeli citizens from Hebron. Organizers attempted to sidestep Knesset regulations that require conferences to be approved by the Knesset Speaker by defining the event as a gathering rather then a conference. "Time after time, certain Members of Knesset try to act behind my back and that of the professional staff of the Knesset for cheap political gain. Lies are destined to be revealed," Edelstein said. A backlash is growing against a planned meeting at the Knesset that calls for the Jewish community to be ousted from the city of Hebron. Three Members of Knesset, Ayman Odeh and Dov Khenin of the Joint List and Michal Rozin of Meretz have organized the "Hebron First" gathering, which will call for Hebron to be the first in a series of areas to have Jewish residents forcibly removed. They believe that Jewish communities in Judea and Samaria are an impediment to creating a Palestinian State and that Hebron Jews in particular are "extremists settlers" which have been "leading the government to enact a cruel segregation regime." In response, Members of Knesset Moti Yogev of the Jewish Home party has called for the general public to register and participate in the event in order to show a pro-Hebron perspective. MK Yogev stated, "who is buried in the Tomb of the Patriarchs in Hebron for the past 3,800 years? Abraham and Sarah, Isaac and Rebecca, Jacob and Leah - the founding fathers and mothers of the Jewish people." Yishai Fleisher, international spokesperson for the Jewish community of Hebron told JNS news, 'let’s just call this gathering what it is: a plan to ethnically cleanse the tiny Jewish minority in Hebron and make it Judenrein... to evict our ethnic minority from the cradle of Jewish civilization in order to appease the jihad. This will only make further war against Israel and against decent Arabs who want to live in a free and diverse Jewish state." 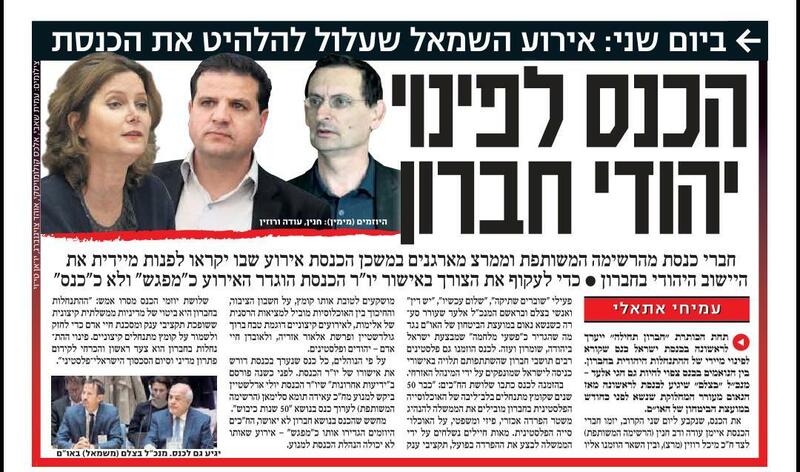 The three MKs organizing the meeting have sought to circumvent Knesset rules by arranging it as a "gathering" as opposed to a "conference" which would necessitate the approval of the Knesset Speaker. The three MKs have invited Breaking the Silence and Peace Now to attend the gathering. Fleisher commented, "it’s obvious that the organizers are not in touch with the Israeli public, who visit Hebron to the tune of 700,00 visitors a year. Over 40,000 people came to Shabbat Chayei Sarah including several Knesset members and government ministers. Moreover, the Israeli government has just approved new construction in Hebron for the first time in 16 years." Noam Arnon, Hebrew-language spokesperson for the Jewish community of Hebron added, "the roots of the Jewish people in the city of the Patriarchs and Matriarchs are deep. New discoveries at the Tel Hevron archaeological excavation reveal more and more historic Jewish layers." He compared the goals of the gathering to that of Haj Amin Husseini, the Mufti of Jerusalem who instigated riots against Jewish civilians in 1929. In 1997 the Hebron was divided with 80% of the city going to the Palestinian Authority and 20% remaining under Israeli jurisdiction. * New Record! 40,000 Visit Hebron for Shabbat Chayei Sarah!